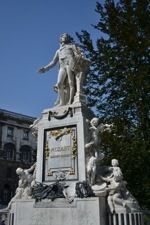 While we might have gotten a slow start, we made up for it today with a full day of sightseeing in old town Vienna. We slept fairly well and had breakfast at the hotel, included in the rate. First destination was the Opera House. 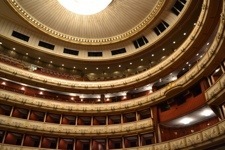 We chose to have a tour, which got us inside many rooms and the opera house itself, as well as backstage. 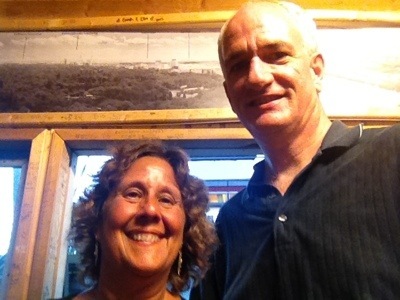 We then used a Rick Steves app that allows downloading of audio tours, all fr free! Instead of reading from his book as we went, we listened and walked, pausing when we saw fit. 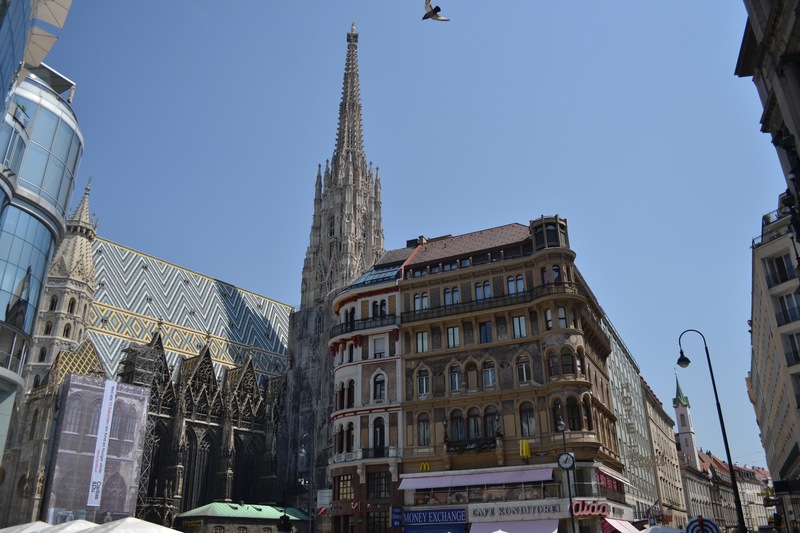 The next big stop was St. Stephen’s Church, perhaps the most famous building in Vienna (feature picture above). We walked a little inside, then all the way around. We stopped for small sandwiches and gelato for lunch. 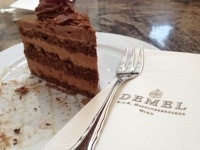 But then the tour took us by Demels and we had to stop for cake. 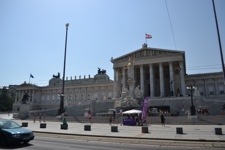 We then walked around the grounds of he Hofburg Palace. We had remembered it from our 2005 visit, so don’t need to do the armory or museum. We then walked over to the Parliament building for pictures. 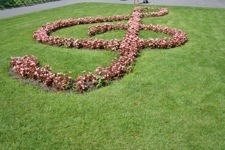 A walk through parks on the way back to the hotel allowed us to see the Mozart statue and clef topiary. Ellen then rested while I did the geek stuff. The idea was to take advantage of our iPhone 4S’s and get SIM cards that would allow for data access while we were here. I went to an Orange store and purchased the cards. A complicated ballet of Verizon arranging with Apple to unlock the phones, Orange providing data and Apple servers updating went well for Ellen’s phone but failed for mine. A call to tech support when I got back to the room accomplished nothing, as did phone calls and tweets with Verizon. It is supposed to work but no one is responsible for making it work. We later found out the personal hotspot is activated, so if in nice, Ellen will let me share get connection. It was hen time for our first foray into the subway system. 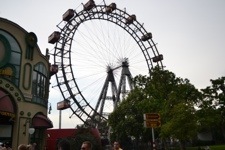 We were off to the Prater, an amusement park Ellen visited as a child and that we had visited last time we were here. We had no problems taking 2 trains to get to the park. We first had to ride the old ferris wheel. We then had dinner at a restaurant on the grounds, sharing wiener schnitzel and turkey schnitzel. We had started out dining outside, but a rainstorm came through and they insisted on moving us inside. The rain let up and we walked the park as it got dark and the lights came up. We u-bahn’ed home and are resting up for our last day in Vienna tomorrow. After two conferences back to back, I was very glad to have this vacation to look forward to. We had been through Austria in 2005 on a Viking River Boat cruise. I call these cruises samplers, as you get a taste but not much more of the places you visit. We had just a few hours in Vienna and it rained the whole time, so we needed to come back. We had used points for the flights, so we were in business class in all directions. That meant we had access to the lounge at Dulles before our flight departed at 10pm on Thursday. We taxied for awhile and then stopped. The storms were north of us, which wasn’t a problem to take off but it was our flight path. We sat until 10:55 and then took off on a modified flight path. The impact of the delay and rerouting was we arrived over an hour late to Paris. We had to get through immigration and change terminals to make our flight in just 30 minutes. After quick walking though a hot airport we made it to our gate in 28 minutes. But the flight had already closed. The flight from Paris to Vienna is scheduled for 2 hours, but got in a little early. Our luggage came quickly, and we bought tickets for €12 each for an express train into the city. 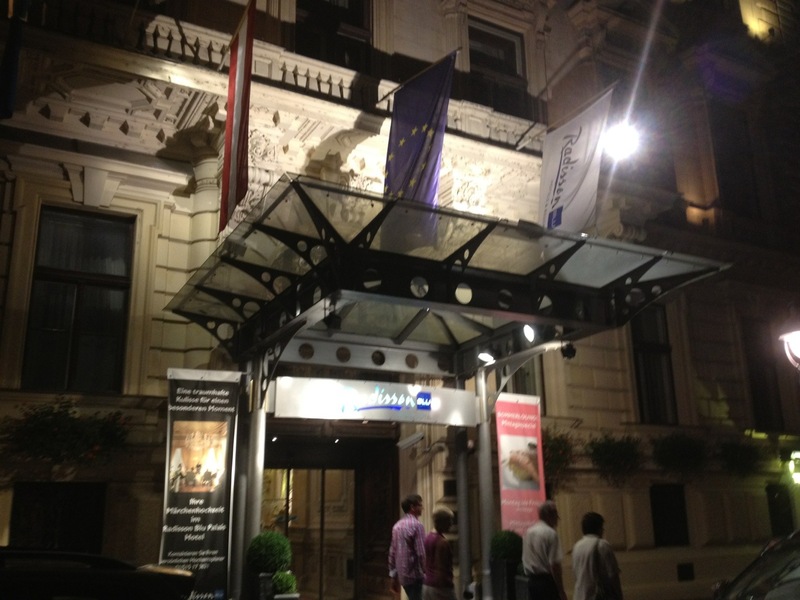 I navigated the 15 minute walk from the train station to our hotel, a Radison Blu in the city centre. We got to the hotel at 8:45pm. The hotel clerk commented on Ellen’s tan, which Ellen said was a benefit of being a teacher. Once we were checked in, the clerk said she upgraded us to a nicer room because Ellen was a teacher. Nice! The room is nice, queen bed, period furniture and a large bath. It is in a former palace. We dumped our stuff and headed out for a little walk. Ellen got a snack, I had tea, and we strolled the area around the hotel. We normally would have used the afternoon today to nap and then begin exploring the city. We missed out on that, but didn’t really lose much of the vacation. Just a slow start. Tomorrow we’ll spend a full in the city, and then we bought tickets tonight for the Schonbrunn Palace for Sunday morning. We have the opening ceremonies of the Olympics on television in the room. It is a small world.